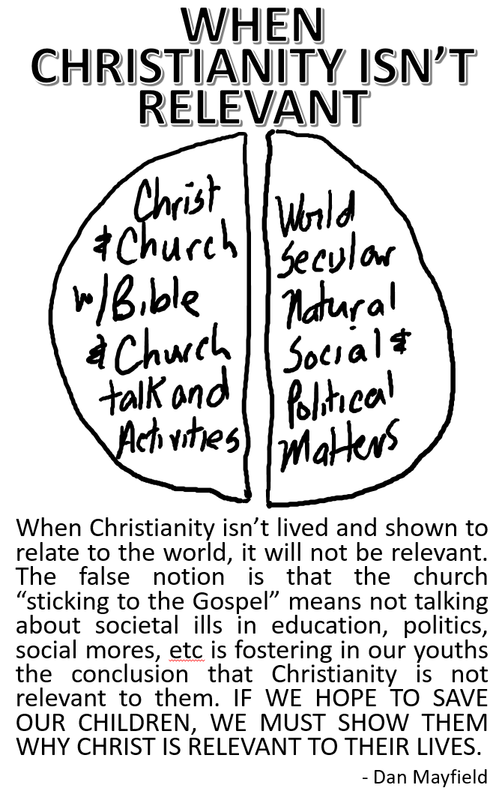 The “relevance” of the church and Christianity to youths is established at home. The preacher could be a real loser and still good parents would overcome their influence. The Elders could be out of touch and still good parents would influence their children to be faithful to God. Even if the preaching could be weak and the classes shallow, still the home will set the tone for a lifetime of walking with God. I’m not excusing should there be negatives encountered in the church, still a God-centered home with parents living their faith will overcome all of these things and more. So stop the excuses. Parents, you show your children why and how Christianity is relevant. If parents say their children fell away because their children didn’t see the relevance of the church, you have to look in the mirror.